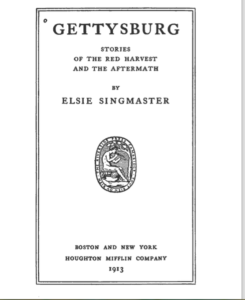 I’ve just begun work on my next audiobook, a Public Domain project, Gettysburg by Elsie Singmaster. These 9 stories reflect everything from the experiences of a young mother and her neighbor taken unaware on the first day of battle, to the battle itself and desertion, to the immediate aftermath on this tiny community through to the 50 year anniversary of the battle. My last fiction audiobook touched on the Civil War period in history, but this gives a detailed view of the toll on the people and community. And now – the research begins! Latin phrases, references to Greek mythos and archaic language sprinkled throughout (publication date was 1913) all provide unique challenges in bringing these stories to life.